In late 2017 I sat at a rickety table in a Helsinki outdoor market, blinded by the low winter sun reflecting off the water, drinking tepid black coffee out of a wax cup and eating a plate of equally tepid tiny fried baitfish generously glooped with a garlic mayo “sauce”. * Sounds great, right? It gets better. At the table next to me a waifish tattooed Valkyrie Jr furiously poked her too-small mobile phone, no doubt trying to call Stellan Skarsgård and object to “letting a lumpy American into her big scene” and complain that “we talked about this last week at Onni and Ella’s house why did you change it” but there I was, blocking her shot, confusing the camera guy and giving the director another reason to regret taking the job. Little did they know I was already aware of a string of grisly murders, and Mr. Skarsgård had already talked to his agent about casting ideas for “the surprise lumpy American”, but I had baitfish to eat and didn’t care. 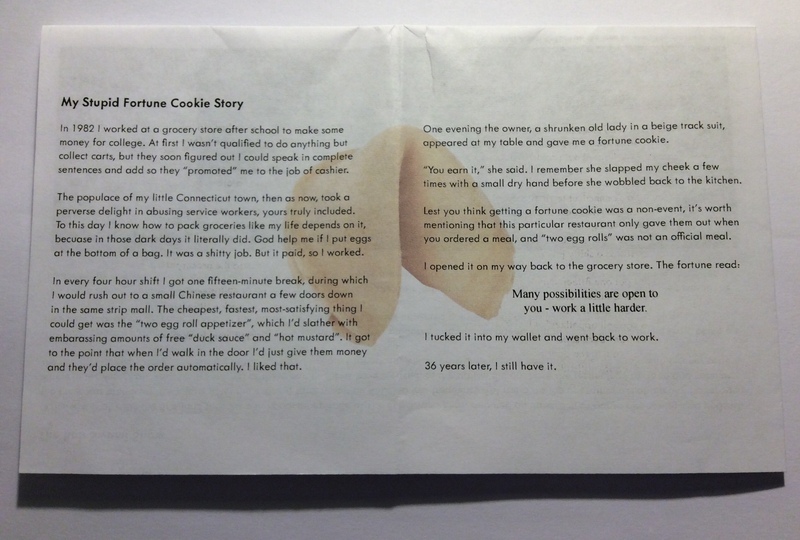 That was the very moment I decided to make a zine. I’d been trying to come up with a way to do something nice for a change, and what’s nicer than opening your mailbox and finding something pleasantly surprising in it? Yes, I know a lot of things are nicer than that, just work with me here, I’m on a roll, it’s my origin story and I like it. It’s not as fancy as being bitten by a radioactive spider, but there you go. When I got home I whipped up enough CONTENT to fit on both sides of a single sheet of 8.5 x 14 inch paper. 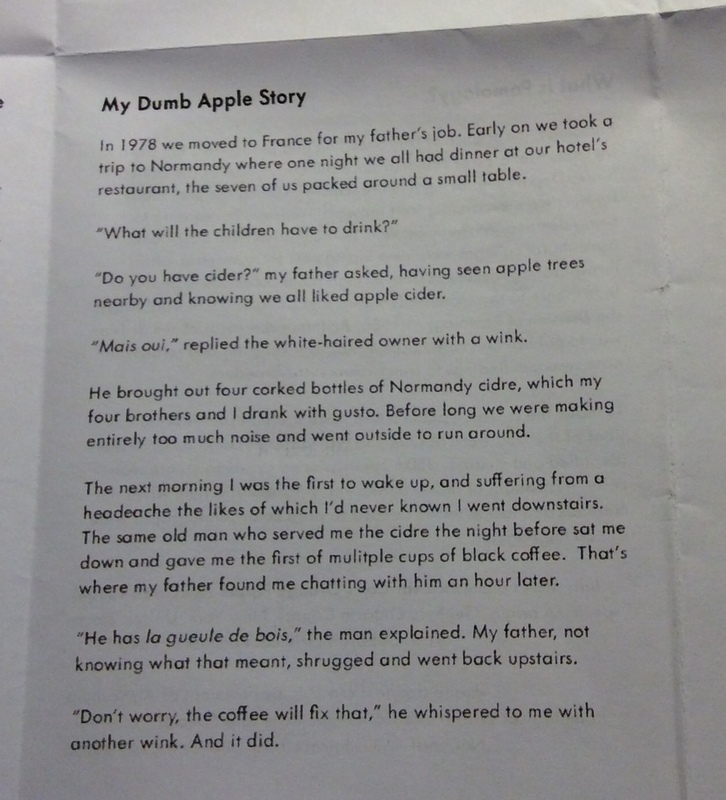 I printed exactly twenty pages at the local office store, folded each one three times into a small booklet, and offered a free copy to anyone in my Twitter community on a first-come, first-served basis. That first issue was a mess thematically, but the second one focused on snow, the third explored the intersection between manual lawnmowers and early 20th century German emergency money, and then momentum took over. Each issue has a brief (generally stupid inspired) story, a list of digital resources related to the topic(s) at hand, and often some sort of inclusion and/or wrapper. 1. The sixth issue featured the mid-20th century “Ask Swami” machine, which for those of you unfamiliar with the ages-old American practice of monetizing boredom and stupidity, was a small tabletop slot-machine-slash-fortune teller-slash-napkin dispenser which, for the price of USD$0.01 (now equal to 1 GBP), satisfied the uniquely American need for hygienic mystical experiences. Remember when Captain Kirk was on The Twilight Zone and fed coins into a box with a bouncy devil head on it? One of those things. I shared the deeply interesting history of this machine and included some reproductions of the fortune slips they dispensed. 2. 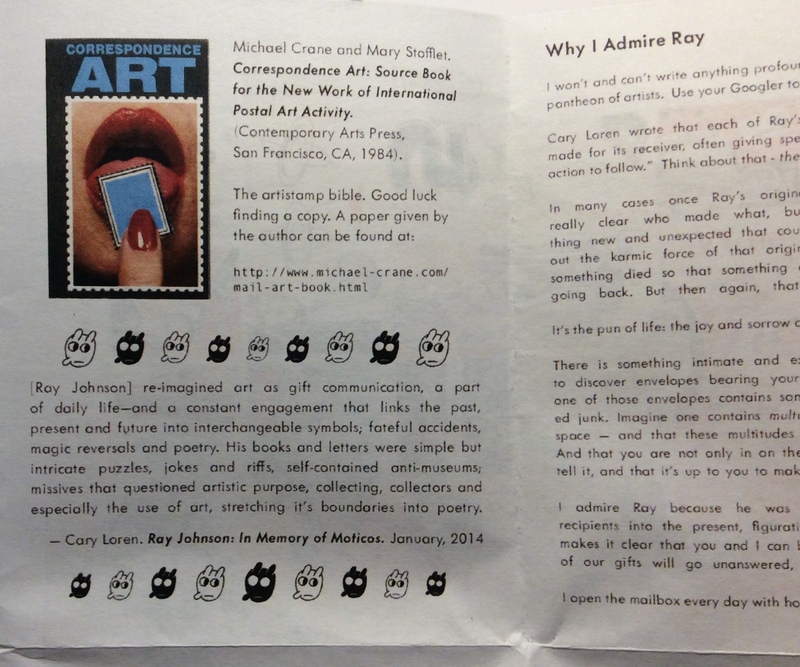 The third issue was dedicated to mail art and included art stamp (“artistamps”) examples shared with me by Sally Wassink, who I interviewed in the issue. 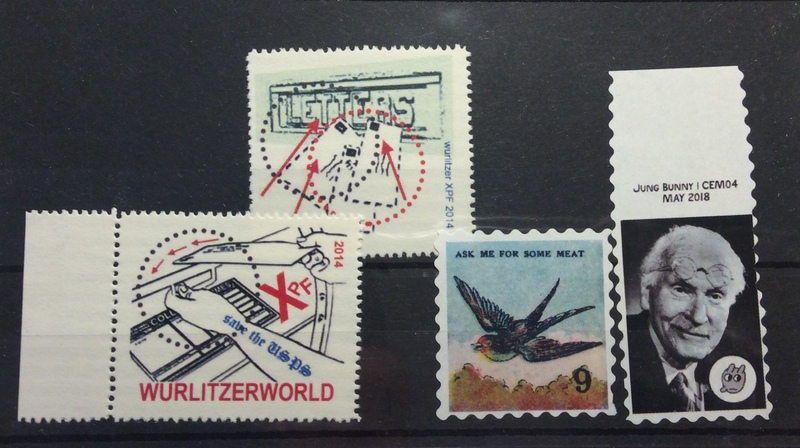 I was familiar with art stamps from sheets of faux postage stamps created by Robert Watts (of Fluxus) that an uncle of mine showed me, and I’d admired Neo-Dada collagist Ray Johnson for many years. 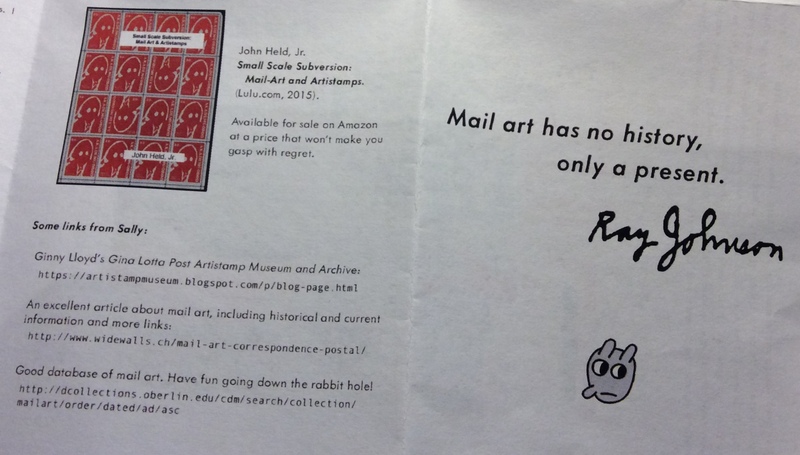 I included a few art stamps of my own design for good measure. 3. 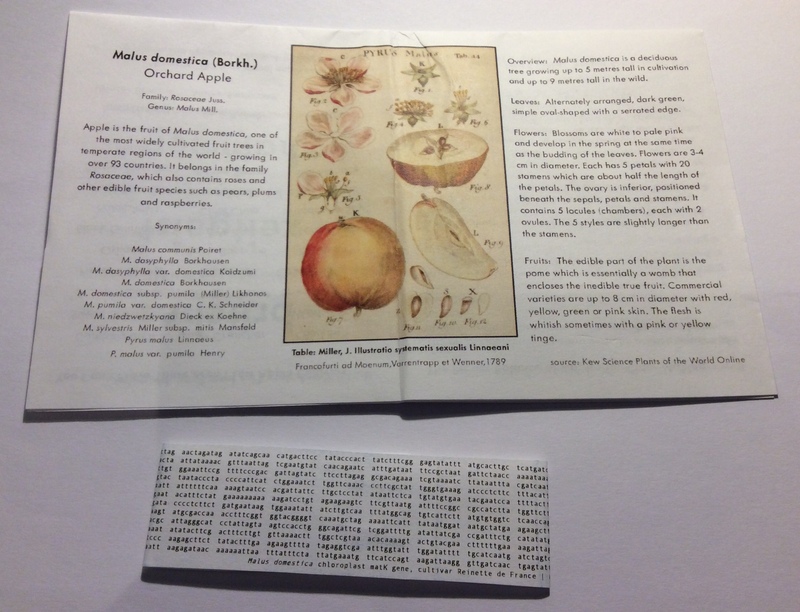 The issue on apples was wrapped with a small band of paper on which I printed the entire 1703 base pair barcode of the orchard apple tree (the chloroplast matK gene of the Malus domestica var. Reinette de France). 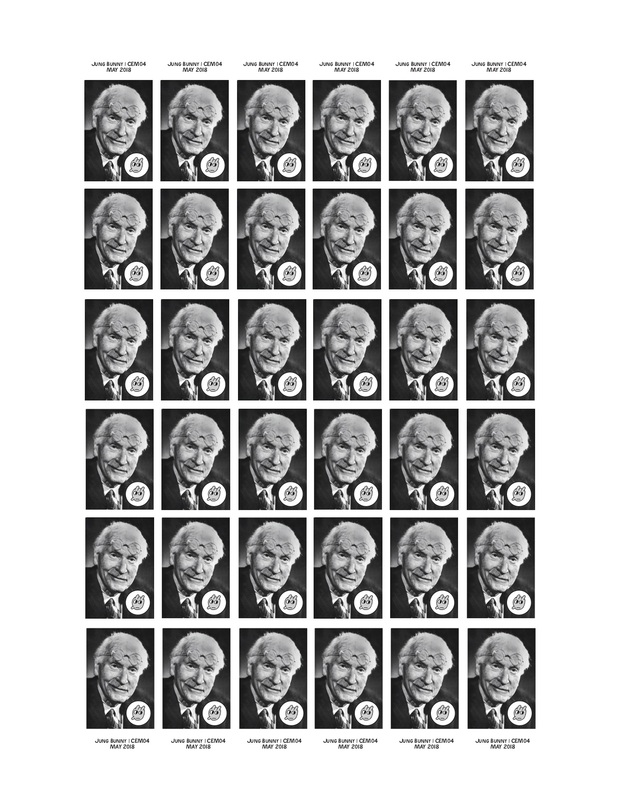 *BONUS CONTENT DUE TO EDITORIAL REQUEST*: The aforementioned third issue was wrapped with a strip of uncut art stamps featuring the smiling face of a middle-aged Carl Jung superimposed with Ray’s signature bunny icon. I called it the Jung Bunny and my analyst was not happy about it. 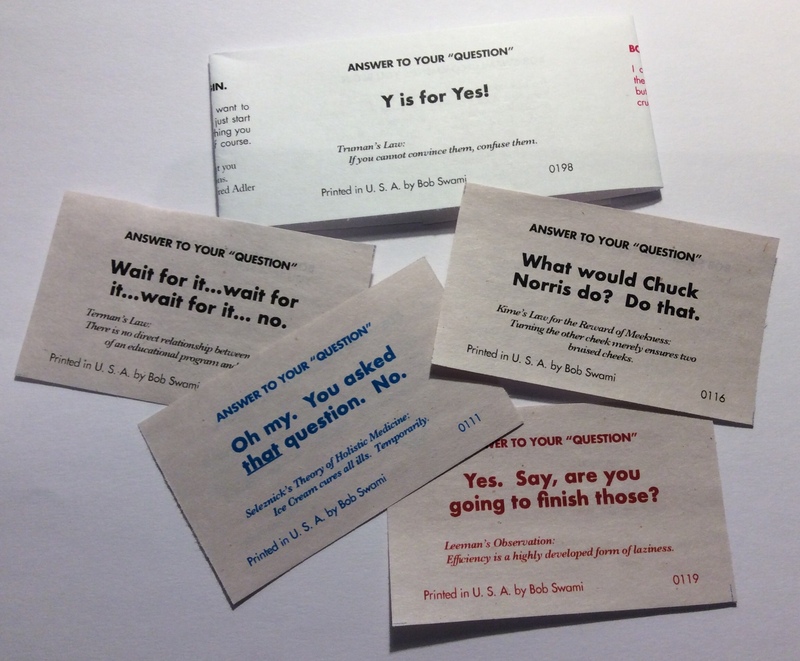 And so, if you’ve ever wanted a physical representation of what a person’s brain looks like in the process of popping out random ideas and thoughts, then why not grab a delicious beverage and take the following multiple choice quiz to see if Corrigan’s Erratic Manifest is right for you. Please circle one; answers in pen will be disqualified. A. My kind of random! Hey now! B. Like looking into a creaky attic chest in a horror movie after three teens have already been horribly yet amusingly killed. C. Something my cat/dog/chinchilla/hedgehog will enjoy sitting on. D. A cunning Labour/Tory/Lib Dem/Dalek plot to distract me from the coming collapse of society and inevitable adoption of Swift’s “A Modest Proposal”. E. Literary Pretension™ of the worst kind, I’m sticking to Viz. F. All of the above, alas, I am alone in my misery. Instructions: each issue arrives, ex nihilo, and as the reader unfolds the issue, the theme is revealed. There’s no digital edition, and back issues are not available. It comes, it goes. And that’s OK.
I’ve come to discover there’s no end to what you can accomplish if you don’t expect to be paid (although let’s face it, in an even partially ideal world we would all be paid for the fruits of our creativity), and as I have no expectations I am always pleasantly surprised. I’m curious about everything, and I’m happy to say that the members of my/our community are too, so everyone wins. It’s a ridiculous benevolent cycle of mutual mitzvahs, and that, dear friends, is the goal. There is more misery in each of our lives than we’d ever care to admit, but in that moment when you open your mailbox and there’s something other than a bill or junk in it, well, that’s a still point in a moving world and I’d like to make it a joyful one if I can. 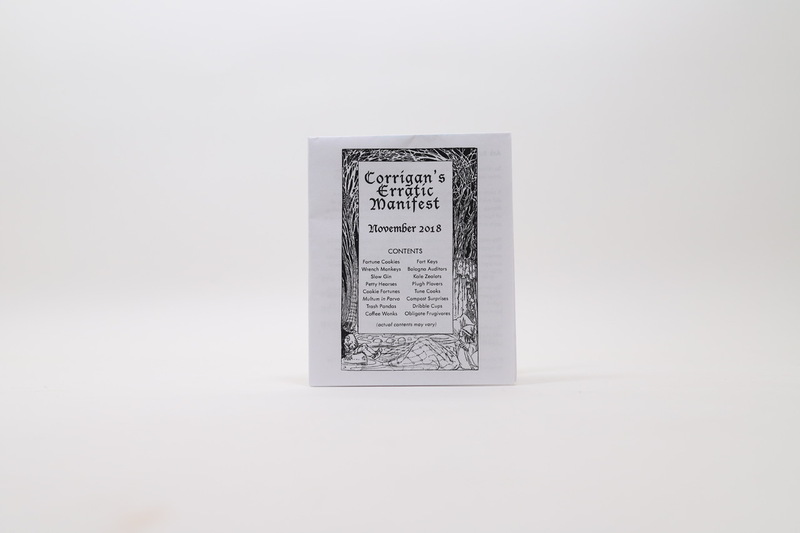 If you’d like to receive your very own copy of Corrigan’s Erratic Manifest, why not drop me a note on The Twitter at @bobcorrigan (I refuse to use The Facebook for reasons) or, if you’re old-fashioned, you can send me an email at corrigans.erratic.manifest@gmail.com. I look forward to hearing from you. Really. *Apologies to all Scandinavian fictional detectives contemplating cases in a similar manner. 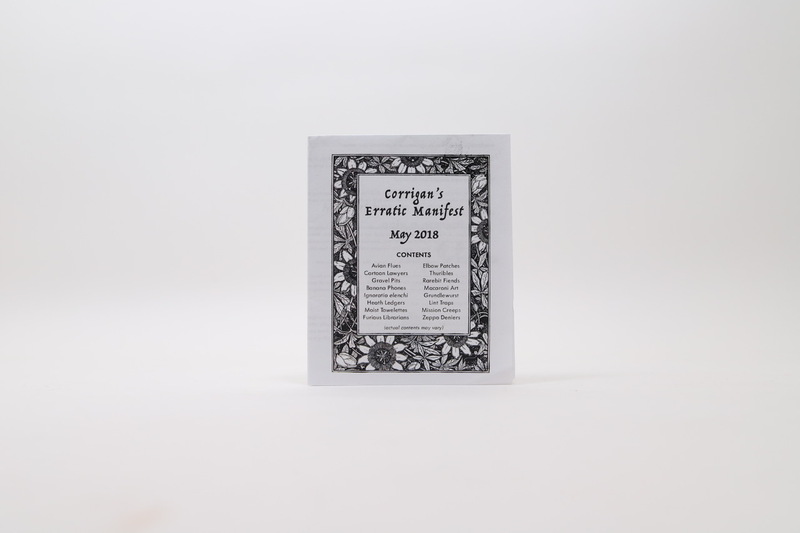 Posted in Essays & features, Interviews and tagged accidental French cidre hangovers, Corrigan's Erratic Manifest, did you really write on your screen?, Fluxus, Jung Bunny, meet the zine, super literary origin story. Bookmark the permalink.